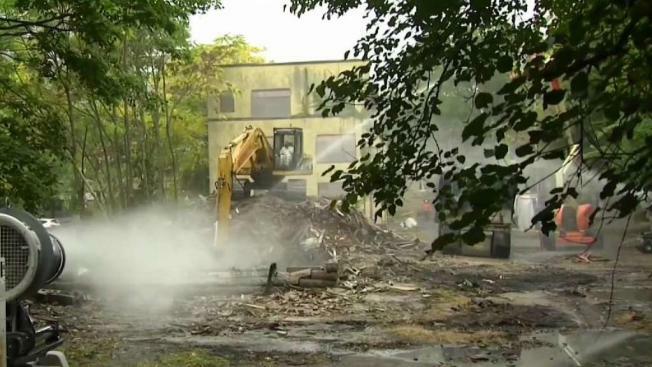 Cambridge started tearing down vacant buildings on Tuesday but neighbors say the city did not warn them about the two-week long project. There's a plan to build more affordable housing in Cambridge, Massachusetts, but neighbors are starting to get annoyed by the loud demolition and the rats that have emerged from the site where it will be built. Everything, including the noise and the dust, is starting to add up for Akhan Mukhano. Cambridge is tearing down vacant apartment buildings at Vail Court, hoping to build affordable housing on the land once demolition ends. The property is one block away from City Hall and is considered prime real estate. The two-week project started on Tuesday right behind Mukhano’s house that he shares with some roommates. “Before the construction, it was a very, very quiet street,” he said. Mukhano says the city never gave them a heads up about the demolition project, and he says communication would have definitely helped. The buildings have been sitting empty now for several years. The city says the owners haven’t been doing much about it, so it was recently taken by eminent domain. Demolition supervisor Maximo Guerrero says it's 14 years in the making. While some neighbors may be annoyed, inspectional services says it’s closely monitoring the construction, especially since the property has been a breeding ground for rats. For now, they are telling neighbors to close their windows to deal with the bad air, and Guerrero says they are using two sprayers to control the dust. Mukhano says for now, he’ll just deal with it. “Definitely more ear plugs,” he added. But he does hope the city does a better job consulting neighbors for the next project in their backyard.